Beginning this winter, Rockefeller will close during days that New York City public schools close due to weather emergencies. Science is a little like the postal service is supposed to be. Neither snow, nor rain, nor heat, nor gloom of night stays its progress. 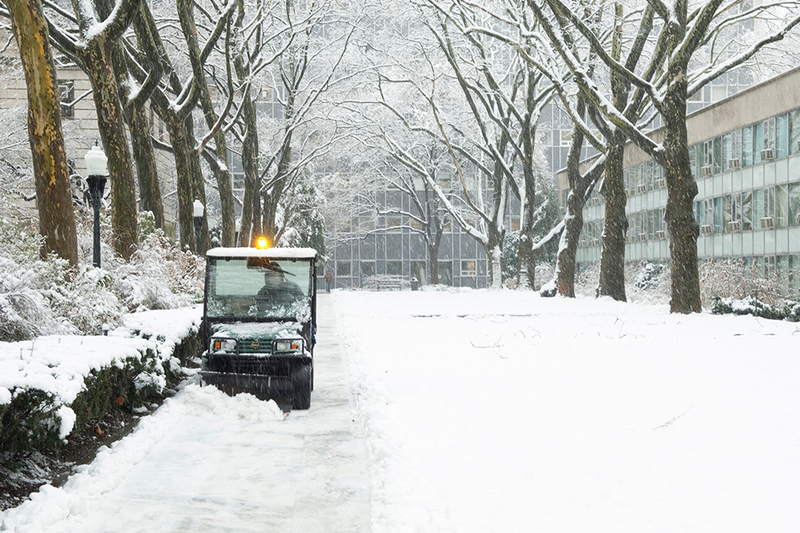 But although the university campus is a 24/7/365 operation, the reality is that weather can affect the ability of many employees to commute safely and efficiently. In response to several severe-weather events last year, the university reevaluated its policies on weather-related closures. The goal of the revision was to balance the need to ensure essential services and excellent scientific support with the strong likelihood that many employees will not be able to commute to campus, or will choose not to. In the past, the policy prescribed that the university remain open in all but the most serious weather events. “In reality, this led to a situation where many employees were forced to take personal time and service levels were unpredictable,” says Virginia Huffman, vice president for Human Resources. Beginning this winter, Rockefeller will instead follow the New York City Department of Education’s guidance on weather-related closures. When public schools close due to weather or other citywide emergencies, Rockefeller will also close. Only essential personnel will be required to report to work during a university closure, and all events will be cancelled. Decisions about school closures are typically announced by the mayor in the early evening the day before a significant weather event is expected. For weather emergencies that occur during scheduled NYC public school holidays, university leadership will make decisions based on the local conditions, including the severity and certainty of the forecast, the expected impact on city and regional transportation networks, and advice from city and state authorities. All closures will be announced via e-mail and on the university’s home page. Many other New York City institutions already look to the public schools as a trigger for their own operational decisions, according to Amy Wilkerson, associate vice president for Research Support and chair of the university’s Emergency Preparedness and Response Committee. The choice to base university policy on the Department of Education’s decisions for public school closures is expected to result in less confusion over whether the university will be open or closed during severe weather events, and allow both managers and employees to better prepare for unplanned disruptions. Wilkerson does not expect the new policy to result in a significant increase in closures: In the past five years, public schools have closed for weather no more than twice a year.